SuperTrapeze and SuperBar combine to form a complete and safe system for transfering. The SuperTrapeze is an offset trapeze handle that mounts to the SuperPole. 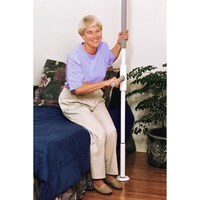 Suitable for clients who require moderate assistance to achieve a sitting position in bed, with all the benefits of the SuperPole. 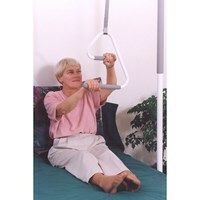 Effective - SuperTrapeze includes the innovative e2 trapeze handle with a ladder-like set of two rails that allows the user to more easily climb up to a sitting position. Ease of Use - the combination of a trapeze + bedside pole - the only product to provide COMPLETE support for sitting up, pivoting, and standing up from bed. Versatile - Does not require special bed or mounting brackets - works with any bed Does not force bed outward from wall as with conventional trapeze systems. Will install beside waterbeds and electric beds unlike floor mounted trapeze systems. Ease of Use - open design of trapeze handle allows it to be hooked onto pole for storage. SuperTrapeze: 0.875/2.2cm diameter, Adjustable 1/2.5cm nylon strap attaches to welded support arm (adjustable in height on SuperPole). 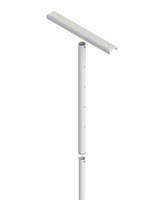 Support Arm Height Range - 12-22/ 30-55cm from ceiling. Fixed to the pole with 3 penetrating set screws. Trapeze Handle - overall size 12x12 / 30x30cm. Trapeze Handle - height range 42-70 / 106-178 cm from ceiling. Floor to Ceiling Range: 93-99/236-251cm (standard). Uni-Fit Extender: NOT TO BE USED WITH SUPERTRAPEZE. SuperPole Ultra: NOT TO BE USED WITH SUPERBAR OR SUPERTRAPEZE. Ceiling Plate Extender: Allows standard ceiling plate (20/51cm length) to span 30/76cm with holes for ceiling attachment to 24/61cm ceiling beam centers. Sold separately. Pole Material: Heavy gauge steel, 1.5 / 3.81cm diameter. High temperature baked powder coat gloss white enamel. Grip Material: Gray, premium high quality grip, 20/51cm long. Does not contain natural dried rubber or latex. Washable. Expansion Mechanism: Steel jackscrew, zinc plated, 1-1/8 fine cut thread. The SuperBar is a horizontal pivoting and locking bar that mounts to the SuperPole, suitable for clients who require moderate assistance to achieve small steps during transfers. lateral falls. Full support when making two or three steps transfers. Ease of use - no reaching, stretching or twisting required. Flexible - more compact than a walker in small restricted areas such as washrooms. Versatile - can pivot in narrow areas such as between bed and wall, narrow hallways, etc. Bed Application - allows weight shift, moving, standing, leaving or getting into bed, or transfer to wheelchair, walker or bedside commode. Bathtub Application - provides complete support for step-over without reaching for wall bars. The SuperBar can pivot away from shower curtains, allowing them to fully close during a shower. Toilet Application - permits pulling up to standing and can provide leaning support while managing clothing. SuperBar - 1.5 / 3.81cm diameter, 16 / 40cm length, locks every 45 degrees (8 positions), height adjustable typically 24 to 38 / 61-97cm (from floor, with limit of 58 / 147cm from ceiling to top of bar. Floor to Ceiling Range: 93 to 99 / 236 to 251 cm (standard). Uni-Fit Extender: Increase floor to ceiling range to 100 to 120 / 254 to 305 cm. Sold separately. NOT TO BE USED WITH SUPERTRAPEZE. Ceiling Plate Extender: Allows standard ceiling plate (20 / 51cm length) to span 30 / 76cm with holes for ceiling attachment to 24 / 61cm ceiling beam centers. Sold separately. Grip Material: Grey, premium high quality grip, 20 / 51cm long. Does not contain natural dried rubber or latex. Washable.